In Part 6 of our Australian Cold Brew Series, we’re joined by Jimmy and Hamish from First Press Coffee. First Press does things a little bit differently as they use a cold drip method rather than the traditional immersion cold brew method that most use. Brendan Hanson: Hey there you’re listening to the Drips & Draughts Podcast. As always, I’m Brendan Hanson and I’ll be your host. We’ve got a great episode lined up for you today for a couple of reasons. One, this is part six of our Australian Cold Brew series. So, we’re continuing to find new cold brew companies popping up in Australia, and we’re trying to get as many on the show as we can. Two, this kind of follows last weeks’ episode, how Colleen from Colds Brew in Dubai termed the coin crafted intensity, just to kind of differentiate his product. Jimmy and Hamish, from First Press Coffee, are using a cold drip method rather than a cold brew method. Well, typical cold brew method, I should say. Rather than the traditional steeping method, they’re differentiating themselves in their product by using a cold drip method. I won’t get into that too much now. They’ll do a much better job of explaining it than I ever would. Just a couple of more quick notes before we get into today’s episode. One, we’re still working on our Cold Brew cocktail e-book. If you’ve got any interest in submitting a cocktail recipe and having your company featured, go to dripsanddraughts.com/coldbrewcocktails, where you can submit a recipe, a picture, your logo, and we’ll try to get you in our e-book. Again, that’s dripsanddraughts.com/coldbrewcocktails. The last piece of business I want to address, I don’t think we’ve got a review on iTunes in over a month now. I know we’ve got some listeners out there and I know there’s a few of you who probably haven’t left a rating or review yet. If you haven’t done so, hop on to iTunes, find our podcast, and just leave us a quick rating or review. We’d appreciate it and it will help the show out a lot. Speaking of the show, if you’re looking for links or show notes from this episode, you can find those by going to dripsanddraughts.com/71. All right, with that, let’s get into today’s interview with Jimmy and Hamish from First Press Coffee. Voice-over: If you’re looking to learn more about cold brew or draft coffee, make sure you check out Keg Outlet’s Ultimate Guide to Cold Brew Coffee and Serving Coffee on Draft. But hey, don’t just take my word for it, here’s Daniel Browning, from the Browning Beverage Company in Marfa, Texas. Daniel Browning: I got on the internet and started looking around. I found Keg Outlet’s Ultimate Guide to Cold Brew Coffee and read it a couple of more times than I’ve read anything in my life. That was pretty much all the research I needed. Voice-over: If you’re looking to start your journey with cold brew of draft coffee, check out The Ultimate Guide to Cold brew Coffee and Serving Coffee on Draft, a free 34 page e-book offered at kegoutlet.com. You can get there through the Drips & Draughts website by going to dripsanddraughts.com/ultimateguide. Brendan: All right. Welcome back to the Drips & Draughts Podcast. Today I’m joined by Jimmy and Hamish from First Press Coffee. How are you doing guys? Hamish: Good, thanks. How are you? Brendan: Thanks for joining me today. I’m excited to chat with you guys. It sounds like you guys do things a little bit differently than a lot of cold brewers out there. So, I’m interested to talk with you guys about that. But before we do, could we get a quick introduction to you, Jimmy, and how you got into coffee? Jimmy: Yes, absolutely. I was basically backpacking before First Press. First Press idea conception sort of happened just over four years ago. I was backpacking the world, looking for my purpose. It wasn’t until I walked into a Whole Foods in the US and saw the state of the cold brew market in the US. I just was looking for ideas and I thought as a player, looked up the market in Australia and thinking there’d be a few different players there. There wasn’t any that I could say that were reaching the level of scale. So, I thought it was a great idea to come into this. I have background in health and wellness. I managed retail stores before I started traveling. So, I knew that market and I knew there was an entry into that market with this type of product. Came back and spoke to Hamish and coerced him into this idea and started this business. Brendan: Nice. That happened four years ago, yes? Jimmy: Yes, four years ago. Brendan: What part of the US were you in, out of curiosity? Jimmy: I was actually in Houston. I was in Houston for a seminar. I was down there at Whole Foods then, I loved Whole Foods. Then I was also in San Francisco for a while just picking out the market there and then travelling around California, which funnily enough, I’m going on Saturday again. Brendan: Nice. You’ll have to bring us some coffee. Jimmy: I know. Whereabouts are you? Brendan: We’re based just north of LA, Ventura County. Brendan: Yes. How about you, Hamish? What’s your background? I’m assuming you got into coffee through Jimmy. Hamish: Yes. Interesting. Jimmy and I have known each other for over 10 years now. Whilst Jimmy was backpacking, I was sort of working in the corporate world. I worked 9 to 9 with the world’s biggest company currently. I was working in a job that I wasn’t super inspired about. I was, like Jimmy, really trying to find my purpose and find some direction and really make something in my life. So, when Jimmy came back from travelling, we hadn’t seen each other in about two or three years. Over a couple of bottles of wine and a couple of late nights, Jimmy started to sort of woe me into this idea of the coffee industry. I’ve always been a coffee lover, but never really wanted or thought to go in to the cold brew industry. So, I’ve always been very numbers centric and Jimmy was selling me on the dream of what we could do with the cold brew industry. But it wasn’t until I sort of dived into the numbers and the data that we sort of really started to find that we might be able to make something like this in Australia. At that time really, no one else was doing cold brew, so it was really in it’s infancy. I don’t know if you’ve ever been in Melbourne, but Melbourne is a city that prides itself on coffee. Especially in the espresso market that is sort of flat white coffee that’s coming, and has been coming for the last five years. It’s starting to really build a name, and we wanted to be part of that. Brendan: Right on, yes. I haven’t been to Australia, but from what I can tell, it sounds like it is a kind of coffee capital and it sounds like cold brew is kind of the next wave that’s coming through. Jimmy: Absolutely. We thought it would come through a lot faster, specifically just when I saw the side of the market in the US for years ago. And it sort of went from specialty, it’s been in the specialty sort of market saying for probably almost a decade or longer now. But to really go and jump into that retail market and enter through the health and wellness sort of range, and then get into the retail marketing independent supermarket chains. That really started to happen in the last three years, two to three years. So, it’s definitely started to grow. It really starting to set some traction in terms of three and a half years ago, I would tell people that I have a cold brew coffee business, and most of the time people would go, “What is that?” Now, it’s very different. Everyone recognizes what cold drip or cold brew coffee is. That’s just a reflection of how it’s moving, which is great for us and any other sort of players in the scene at the moment. Brendan: Yes, absolutely. Let’s talk about First Press Coffee a little bit. Where did you guys come up with that name? Any particular meaning to it? Jimmy: Yes, there is a particular meaning. One of our friends who was a part of the business just at the start, he was sort of helping us with it. He sort of coined the idea. First Press is– we had a few other names, which we were playing around with which we were pretty happy we can go with in reflection. But First Press is, actually, it’s meant to be the first– it’s from like Olive oil and from the first press of those olive oils, and also from grapes, the first press of the grapes. It’s meant to sort of reflect the premium juice, that first juice, that comes out that’s really the best. It’s really a sign of quality and we really wanted that to emanate through the brand name that we went on about to just like put any coffee in a bottle. We really wanted it to be really good quality, and that’s what we do; we look for varied high quality specialty coffee. We really wanted that to be reflected in the name. We also wanted to choose a name that wasn’t basically– First Press Coffee wasn’t stuck with coffee. We have visions of expanding beyond that into sort of health and functional beverages. We wanted First Press to be able to– and the logo to be able to transfer across to different products and markets. Brendan: A little foresight in the name. Jimmy: Yes, absolutely. Yes, we put a lot of thought into it actually. More [unintelligible 00:10:32] side of things. Brendan: You mentioned there was another business partner who help kind of come up with that name. Is it just the two of you operating the company now or do you guys have more partners? Hamish: Yes, it’s just Jimmy and I that do the main operation, we’re both full time in the business. We had other people help us and support us over the years. We started with a really small team. Jimmy and I fortunate enough to have another business partner that’s been a strategist and someone that really gets into the vision and the purpose, and that sort of forward thinker. You mentioned a second ago, that a lot of foresight. We’ve done a lot of work to plan for the future and to build a big brand. Grant’s not in full time and he might be because he really wants to start us in that strategy well, but he’s been integral to our growth. Brendan: That’s nice to have somebody like that you can bounce ideas off of or go to for some — Another person to give you some ideas. Hamish: Absolutely. Yes, it’s huge. We’re very lucky to have a really good network of people around us who have reached levels of success in their businesses. Just to shoot ideas with mentors and different people has been monumental for the journey. Brendan: Of course. As you guys are a cold brew coffee company, do you guys just do cold brew right now? Do you do any like– Sell any beans, anything else, or is it strictly cold brew? Hamish: No, we’re strictly cold brew right now. We have toyed with the idea of selling out beans. We do have a bit of an online presence, but we’re mostly in stores and retail. We have toyed with the idea of selling out beans, but we’ve got some other projects that are on the horizon. I might let Jimmy — He looks after them, so I might let Jimmy talk about them. Jimmy: Strictly, right now, we just do a straight cold drip coffee. I think it would probably be closest to the concentrate cold brew that is in the US. It’s designed at a strength where 50ml is actually one shot of coffee. We have it in the 100ml double shot, and then we also have the 500ml which is 10 shots of coffee. People can either have that straight, or we’ve designed it in a strength that they can mix it with a bit of milk or a bit of water as well, if they wanted to dilute it. Then we’re just about to enter into the sort of ready-to-drink format market, by bringing out some alliance of a latte style cold drip in a 250ml bottle. That will be — We’ll have a straight pure aspersion, which is like from Colombian and Ethiopian beans. So, we’ll have that really beautiful floral citrus flavors coming through. Then we’ll have another one which is from Brazil coffee bean, which has that chocolate nutty base. That will be infused with cocoa and a little bit of coconut sugar just for those people who like it a little bit sweeter. Then we’re working on a few other drinks as well with the dairy free iced coffee with coconut milk. It works fine with Almond milk as well, but there’s been a few manufacturing challenges. That’s been a two-year project and a bit of a sore spot for us, but we’ve learned a lot through the process, and we’ve been looking [inaudible 00:13:59] . Brendan: I know how that goes on the equipment side of things. Jimmy: Yes, absolutely. It’s been challenging. Brendan: So, right now it’s basically just a single coffee that you guys sell that’s bottled differently? Jimmy: Absolutely, yes. It’s the same thing. Brendan: Was it requests from customers and clients to add on different skews and different styles, or is that just something that you think the market’s ready for? Jimmy: We had different beans at the start. We’re doing a range of different — We had like Brazil, Honduras and Ethiopian. We decided to scale in back and bring it into just the two skews, just to reach economies of scale with our distribution, and to really just be able to reach that level of the market. One of the big challenges in this market, and you see a lot of players come and go, is scale. So, you have to be able to reach and do everything you can if you do want to be bigger and not just stocking a few people around you. You need to reach levels of scale. Brendan: The flat white, right? Jimmy: Yes. Well, there’s the flat white and the latte. 90% of the coffees sold at cafes are all with milk. So, even just pour overs and filters are sort of coming back into the same– or coming into Australia, basically. It’s quite an education game for us to be able to teach consumers about black coffee and that it’s not that scary and that it’s not that strong. It’s actually quite beautiful and it makes you feel really good. That’s been a lot of the education around that. I’m trying to teach people that they can drink coffee without milk and sugar. Brendan: Yes. That’s kind of how I got into cold brew. I think a lot of people listening would probably agree. You guys bottle, do you guys do any kegging or serving on draft or not yet? Hamish: Not yet. We’ve experimented a little bit with nitro and kegging. It’s certainly an area where– Because we’re direct to consumers through our channels are mainly retail, that project, although we can do it, we would to love to find a way to do it in a way that we could put on a shelf. [unintelligible 00:16:57] some of the stuff coming out of the US. The nitro canning, the [unintelligible 00:17:00] draft latte, they’re areas that really excite us. Because that’s an offering that is just really unique and special and you can really control the experience from start to finish. Kegging and us working in that world is a very one-to-one relationship, where we’re probably going to have to jump in and do a lot of the hard work in a retail space or however we do it. So, we’d love to find a way to really have that experience on a shelf. Brendan: Got you. I don’t know, though. I think you guys would have a great tap handle with those antlers. I’ve seen those up on a bar tap. Hamish: Yes, we did that before. Brendan: Well, cool. Let’s move on a little bit and kind of talk about your brew process. I noticed your site and some of the emails you guys referred to it as cold drip rather than cold brew. Can you kind of share what kind of differentiates or how you guys differentiate it as cold drip versus cold brew? Hamish: Yes. It’s a question we get quite a lot, because the cold brew industry is usually a similar process across the board. We really got into– We were very fortunate to start with a close friend of ours that was starting a business where he was making a cold brew specifically for espresso martini. Cold brew, cold drip. He was using a specific method which was cold drip coffee, which is using a hario or tiamo, whichever designed cold drip device. He was making a strength that was suitable for espresso martini. So, he gave us some knowledge on the start that there’s really cane and helped us with a lot of our [unintelligible 00:18:48] stuff. But we found that there was this differential between cold brew, which is sort of soaking barrel and let the coffee extract, and a cold drip which is sort of column-based extraction. Not to bore you with the chemistry behind it, but when you contain the coffee in a separate chamber and let the water pass through it, you get this different extraction rates for the different molecule sizes. Some of the smaller molecules will extract at a quicker rate and some of the larger molecules will extract at a slower rate. So, rather than just throwing it all in a barrel and letting it steep out slowly over 10 hours, you actually get this really subtle beautiful flavors coming through in different ways. We were really intrigued by that at the start. We thought that that was an offering that no one else was doing. To this day, we haven’t really seen anyone else, any major people around the world, use our methods. But we find that the extraction process and the quality that we get at the other end of it is superior to that of traditional soaking cold brew. Brendan: Awesome. Would you guys mind sharing some of your processes? Like your coffee to water ratio. Obviously, there’s not a steeping time involved in the drip process but there’s a period that water’s dripping through the grounds, right? Hamish: Yes. When we were trying to figure out our concentration, what we tried to do is actually find the right concentration. Not go with concentrate [unintelligible 00:20:24] strength, we wanted to find something that was just a really nice strength that you can have with ice. It was strong enough to have with ice or straight, but it was subtle enough to be able to mix with some other things. We found that we fell into a ratio that was somewhere between eight to nine liters per kilo of coffee. We found that that strength worked really well for us, because like I said before, you can drink it straight and you can really enjoy the subtle flavors, but you also have the ability to mix it without feeling too weak. Brendan: During your brew process, what kind of time or what kind of volume do you guys do when you brew? Hamish: Our current machine we can do about 300 to 400 liters in one run and we run over about a 10-hour process. We do try to control some variables. We try to get the temperature as steady as possible. We don’t use any heat obviously. So, it’s just trying to keep that ambient temperature consistent so the extraction process is as smooth as possible. Brendan: Okay. So, you brew with like ambient water. You’re not putting chilled water or ice water to brew. Hamish: No, we just try to– We do have a specific temperature that we sit on, but that’s something that we can control. It just changes the extraction process. Australian weather, we have 40-degree days, we have 10-degree days. So, that’s a huge differential. Brendan: A pretty big shift. Hamish: Yes. If you’re brewing in 40-degree weather, you’re going to extract a lot of the oils, you’re going to have a completely different product. Jimmy: That was Celsius as well, Brendan. Hamish: That was Celsius temperature. Brendan: Oh, yes, I’m getting used to this now. I think you guys were the sixth or seventh. Yes, I’m doing math over here trying to figure out how hot that is. Let’s shift gears a little bit and kind of talk about just the Australian market in general. We’ve discussed it a little bit, but what do you guys see as like the current market being? Just kind of untapped or a lot of room for growth still? Jimmy: Definitely, a lot of room for growth. Definitely, there’s more players coming up now as you would’ve– I think you’ve interviewed some of them. We, as I remember, in the markets that we were going to, a lot of the stores that independent supermarkets and health food stores that I went into three and a half years ago, there was absolutely nothing in terms of cold-drip and cold-brew coffee. It was the only sort of thing. Brendan: So, you were having to introduce and educate at that time. Jimmy: Yes. Basically, what that was really interesting at the first start, we really had to hold the store’s hand to introduce the product. That involved things like tasting, things like teaching the staff about it, and just really making it quite clear about what this product is. Then what’s been beautiful over the last couple of years as we moved into more wide-out stores like independent supermarkets where you don’t really have that chance to really educate the consumer or the stockist, the products just started to move in these places. That used to be just in very specific areas, but now, it’s starting to widen out to greater Melbourne out to suburbs of Melbourne. Now, 50% of our market is out in New South Wales as well. We’re just about to launch our distribution in Queensland and Perth. We’re also in South Australia as well. So, the market’s really growing and it’s not just in that specialty coffee, the very niche sort of hits the scene anymore. It’s definitely grown out of that. It’s great to actually start to be next to some other coffees on the shelf, because as you know, it does help to grow the market when there’s more players there and people start to recognize what it is. I think the biggest challenge for any company trying to grow in this market, in Australia especially, I’m not sure about US, is scale. It’s relatively easy to borrow out of a 30 liter drum and take it around to three or four stores in your closest area which is what we did at the start. But to really start to grow and reach levels where you’re making hundreds of liters, thousand liters at a time, and then shipping it around the country and having to get life on it is all the things that we worked very hard on in the first one to two years. It was super hard because there was a lot unpredictable things that would happen with the coffee that we just didn’t know about. That, I think, is the biggest challenge, is scale, and trying to get out there and trying to really work through those first things that are inevitably going to happen to try and stop you. I think we’re really starting to see some of the big players coming into the market now, which will also help the smaller players as well. I’m not sure if you’re aware Califia has just come in. They’re an area the big majors with their cold brew. They’re on a milk cold brew. Brendan: Yes. I’ve heard some of their products now going into cold brew. Jimmy: Yes. I’m hoping that has an effect on the market. We have just one of the biggest iced coffee companies here just bring out a cold pressed coffee with milk. It’s just all of those little things just help [unintelligible 00:26:04] someone else has never heard of cold drip cold brew. They send their advertising, their marketing, because they’ve just got marketing spends that we can’t even compete with. It’s all of those little things that will help consumers recognize us and the other small players around when they’re on the shelf. Jimmy: Yes. That’s why the cafe saying is really good for us as well because cafe — The really good cafes, they have their cold brew and their cold drip. That’s a level of education as well. If someone has a really nice cold drip at a cafe and then they see us in the store, then they might be more inclined to give us a shot. Brendan: Yes, absolutely. I relate a lot of things to the craft beer industry when we’re talking about coffee. This is one of them I think. If I see a new cold brew, I want to try it. Just like any time I see a new IPA, I want to go try that beer as well. I think the same can be said about coffee and cold brew. Jimmy: Yes. I’ve actually made that link as well a lot, just with a lot of different craft beers come up. You want to try the beers when they come out because you like craft beer. The same with wine as well. We’ve tried to really position our brand and our cold drip coffee as that experience. It’s not just a coffee just to wake you up, it’s something that’s beautiful that you can explore a lot of different flavors that you can’t taste in your coffee that you get from your cafe. It’s also great for energy and great for getting things done and for making you feel really good. That’s been a part of our marketing plan, is to really start to redefine what coffee is to people. That’s why we thought it was a really good way to move in through the health and wellness industry and that’s where we had a lot of people resonating with who we are. Let’s hope it does grow our brand a lot as well. Brendan: Cool. Moving forward, what do you see the market in Australia turn in into in the next one to three years? Jimmy: I see a lot more competitors coming up. I see probably nitro coming in and starting to roll in. Nitro coffee. I see probably a little bit more of the health and wellness angle. A lot of the [unintelligible 00:28:45] coffee is now putting some cold press coffee in it. Reducing sugar. Smaller quantities instead of this huge milk cottons. I think that it’s just going to grow in terms of the amount of stores that can actually put it on their shelf and free to move. I think that all the other coffee, the cold press coffee and the cold brew companies, will just need keep hustling to basically educate people because it is a snowball effect and it’s starting to move forward. Brendan: Yes. Sure. Nice. I have a note to ask you about your blue sky plans. If all goes as well, where do you see yourselves going in the next few years with First Press? Jimmy: Yes. We have quite few plans. Obviously, we’ve been thinking about it for a long time since idea conception. We really wanted to keep bringing out a new ranges of coffee products that are aligned with our core values of vitality for health strength. We wanted to really bring out coffees that have that positioning of better for you. We’ve got a range of the Aussie days that we want to bring out. We’re planning on bringing out a line of coffees that would be with the Dairy Fray. Either with an almond or coconut milk, which we’ve been working– as I mentioned before, we’ve been working quite hard to do that. We also love the idea of nitro coming through. We’re actually in the initial explorative stages of trying to work out how we can do a nitro coffee not just on a draft tap, but in a bottle or a can that we can put on the shelf. From there, as we can get more life, we’ve been in initial discussions with some people around getting distribution up into Asia. We see that as a huge market. That’s why we’ve been really trying to also create a really strong brand that can be recognized. We see this going into Asia. We see that market still as very young in terms of coffee and cold brew. I think there’s a lot of potential out there. It’s warm. We’ve been in initial chats, there’s obviously a few hurdles we need to get past to reach those levels of scale, but that’s what’s on the agenda. And then take over the world. Brendan: Right on. I hope to see some in the US here soon. Jimmy: I would absolutely love to sell in the US. I’ve actually got a picture of Whole Foods on my vision board. Because that was the first time when we thought about cold brew coffee. I would absolutely love to be in the US. As you know, it’s a huge market, but it just seems to me like there’s a lot of different players and there’s a lot of people doing different things with cold brew and creative things with cold brew. It’s great. I would love to get there, but it would, just be how do we differentiate our self to everyone else that’s in there, that’s in that market? Brendan: Yes, I mean you’re right, but I think you guys have differentiated yourself a little bit so far with your brew process and the way your going. Good first step. Brendan: Well, cool. I think we’re just about done, but before I let you go, let me ask you guys, what are your current favorite ways to enjoy your cold brew or cold drip? Hamish: Mine would be in an early morning rising setting. I’m a bit indulgent, I do like a splash of milk, but still to make it quite strong. When I talk about a splash, literally a splash. But in my more indulgent sort of relaxed setting, I do like it like scotch. So, a big block of ice, and then just letting the flavors come through as that block of ice melts. That’s probably my favorite. Jimmy: I’m a purist. I love it straight. My favorite cold drips are definitely from the more fruitier regions. So, the Ethiopian coffees, the Colombians, the purest which we’re about to bring out is like just unreal. It’s very interesting because that’s my favorite. When we first started this business, we had a Sidamo, which was from a region in Ethiopia that we brought out. We thought that was actually going to be the most successful coffee. It was a really good lesson that just through farmers’ markets which we were selling our coffee, that sometimes the consumers know a little bit more about the market that you do. They sort of told us that it was just a little bit too out there. It was very fruit explosion and they didn’t like it. That’s why we went for a product that initially we didn’t like as much, but proved to be much more successful in the market. Brendan: Very interesting. Cool, guys. One more question. If you guys weren’t in the coffee business right now, what would each of you be doing? Hamish: That’s a really good question. I think I’d probably still be slugging away in the corporate world and Jimmy might be in the world of advertising. Jimmy: I’d probably be definitely in health and wellness related. I would be interested in the organic food industry, the growth of that. I had a dream, before this business, of actually working for Whole Foods, higher up. I love that market and what that market is doing. Just essentially, I’d be trying to find a job where I can travel, because that’s my passion. Hamish: At the very start, though, we did mention before, like Jimmy and I were a couple of bottles of wine and we were getting together quite often. That wasn’t necessarily about cold brew. We really wanted to sort of flex our entrepreneurial muscles and really get out there and start our own business. Having said all of that, I still think Jimmy and I would probably be in business together just in some other venture. We’re very happy though we’re in the cold brew industry. Brendan: Nice. I think it’s a fun industry. As we’ve said, I think it’s got a long way to go. Guys are in on the ground floor. Jimmy: Yes. People get excited about coffee. That’s what’s really good about it. It’s also like people are quite passionate about it. When we found that even in Australia people are quite polarized about cold drip coffee and cold brew is when we saw they’re going to love it or they don’t. I think that’s been an asset to it because it really does create a following. We’ve got a market of consumers that really just love our product and are dedicated to the cold drip trend. So, it’s been good. Brendan: Nice. Well, cool guys. Thanks for carving some time out for me today. What if people want to find you guys either online or social media, where can they go to do that? Hamish: Yes, at just firstpresscoffee.com, instagram handler is @firstpresscoffee. A quick Google search will also find us pretty quickly. Jimmy: They can get a hold of us on email, on our website, if they want to ask us any questions. We endeavor to get back to every email and we’re always willing to help other people out, especially if they’re in the start of the business, because there is no way we’d be where we are without the help of others as well. Brendan: Right on. Well, cool. And you know what? I just popped on your website and I noticed you have a recipe tab. I’m going to have to hit you guys up for a couple of recipes. We’re putting together a cold brew cocktail eBook. We’ll have to feature one of your recipes. Jimmy: Yes. We’ve got a few recipes that’s beyond that with cocktails. So, yes, we’ll talk. Brendan: Nice. All right, guys. Well, thanks again. We’ll get this episode out for you soon. Brendan: All right, thanks for tuning in today and a big thanks to Jimmy and Hamish from First Press Coffee for joining us today. Make sure you go check them out at firstpresscoffee.com. It was great having them on today because they use a cold drip method, and coincidentally, we’re launching a new product, I think it’s going to be next week, stay tuned for that. You can keep an eye on our website kegoutlet.com. Subscribe to our newsletter there, if you’re looking for updates. I believe that product will be launched next Friday. 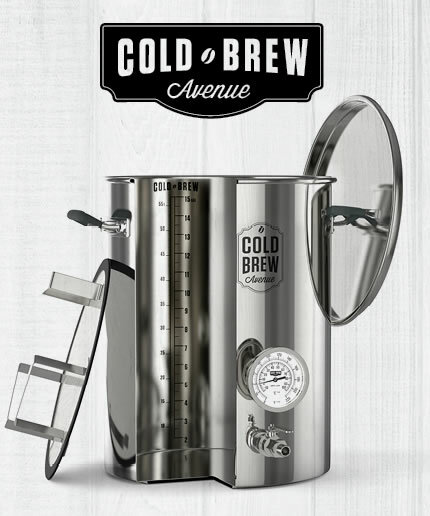 It’s a new style cold brew system that we’re excited to get out into the market. All right. Once again, if you’re looking for links and show notes from this episode, you can find those by going to drips&draughts.com/71. And hey, if you’ve got a cold brew cocktail that you like make sure you submit that. Go to drips&draughts.com/coldbrewcocktail. Lastly, make sure you hop on over to iTunes and leave us a rating or a review, or if you listen to us through Stitcher or Google Play, a rating and a review would work there just as well. That’s going to do it for today. A final thank you to Jimmy and Hamish from First Press Coffee.